Video conferencing has become an integral part of day-to-day and business communications. As the era of NFV/SDN severs and WebRTC technology begins, successful deployment will be dependent on the ability to bridge modern and legacy networks, codecs and standards. A revolution in multimedia communications and video conferencing, ORION-HMP is a video conferencing platform providing unmatched codec interoperability and call quality for all devices; regardless of network, signaling protocols or bandwidth, in addition to many other features and advantages. ORION-HMP includes advanced, high-quality encoding/decoding capabilities, enabling frame rates of 60 FPS (and even 120 FPS in certain scenarios). Resolution reaches 4K and full HD, while VGA and CIF are available for bandwidth restricted connection. In addition, ORION-HMP overcomes low bandwidth connections via Bit-Rate and Resolution adaptation mechanisms, maintaining a high-quality experience for all users. And by dint of its unique GPU processing, it provides ultra-low processing latency (<30mSec). The ORION-HMP capabilities don’t come at the expense of quantity. Rather, ORION-HMP leverages the GPU of any COTS INTEL server to exponentially increase concurrent conferences per server and participants count per conference. That’s a dramatic increase in service sizing and at the same time a dramatic decrease in Operating Expenses, as well as cutting ongoing energy consumption by up to 90%! 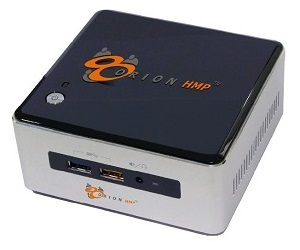 ORION-HMP is available either completely virtual, or preloaded on a NUC server. A low-cost/low-power mobile i5 processor consumes 15 Watts, yet achieves better video transcoding performance than a 20 core Xeon processor consuming over 100 Watt. SURF offers built-in interoperability with SIP & H.323 signaling, in addition to accommodating all video and voice codecs. SURF provides the only scalable and cost effective option for supporting and iplementing H.265 and VP9 codecs on a GPU accelerated server. SURF provides the highest quality multi-party video conferencing, complete with the industry's lowest achieved latency.